Since receiving the biggest endorsement ever from the head honcho, the supreme of the super celeb world, the man himself – Mr Barrack Obama – there’s been an unprecedented interest in the Zune, which has been great for Microsoft – it’s managed to bag some free advertising. 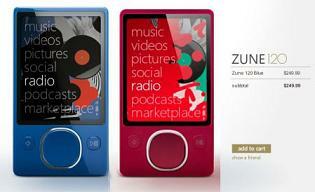 So these Zune 120s with red and blue hues should go down a treat, especially if you’re ultimate desire is to actually be Barrack Obama (you can take yours to the gym too). Other than wanting to emulate the President elect, the $249 price tag is not too bad an incentive to go for the purchase either. So if you’ve only just realised what you want for Christmas, orders need to be placed here before the 19th to ensure there’s no tears on Christmas day. Although this applies to our American pals only. I’d imagine UK Zune hopefuls will need to place the order as soon as.